Fast-Food Chains Back Away From Limits On Whom They Hire Seven fast-food franchises, facing potential prosecution from the state of Washington, abandoned a practice critics say hurt workers' chances of earning more and moving up the ladder. 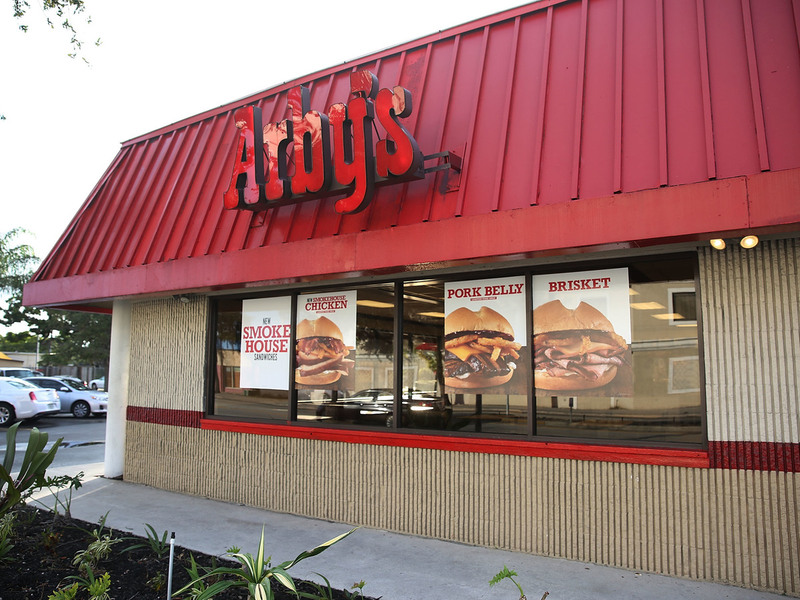 Arby's is among seven fast-food chains that have agreed to stop limiting their workers' ability to take jobs at other restaurants in the same chain. The move came after Bob Ferguson, the state attorney general, threatened to sue them over the practice, saying it was anti-competitive. The chains — including Arby's, Jimmy John's, Auntie Anne's, Buffalo Wild Wings, Carl's Jr. and Cinnabon — will stop enforcing or using such practices across the country. McDonald's previously agreed to remove such restrictions. The announcement comes on the heels of a separate probe announced by 10 other state attorneys general and the District of Columbia into the same issue. That investigation involves eight chains: Five Guys, Dunkin' Donuts, Burger King, Arby's, Little Caesars, Panera, Popeyes and Wendy's. For many years, fast-food franchises agreed not to recruit or hire one another's workers within the same chain. These "no-poach agreements," as they are known, meant a worker couldn't get better pay or move up the ladder by going to another franchise. Ferguson said such agreements are clearly illegal. "These no-poach clauses, I think, are an example of a rigged system," he said. "I think you're a worker, you have no idea this clause exists, you haven't signed it. And yet when you try to go to another business to improve your wages, you can't do it, because of this condition in a contract that you never signed." Ferguson says the fact that the seven chains conceded bodes well for workers at other fast-food chains. "We have a lot more fast-food chains that were investigating and that we expect to come to the table and sign similar deals, and if they don't, we will litigate," he said. Princeton economist Alan Krueger has written about the prevalence of no-poach agreements in most franchise operations and says 80 percent of fast-food chains include such agreements. In franchised industries more generally, about 58 percent include similar restrictions. "I think it's a major accomplishment," Krueger says of the concessions. He says such restrictions make the labor market work inefficiently, keeping wages artificially low. "I think it's very hard to come up with a sound business justification for this practice, other than reducing competition for workers," he says. Ferguson and other attorneys general say they will also seek to end the practice in other franchised industries, as well.